Before I will finally go back home to Duisburg I thought it was nice to inform you about my Public Viewing experience here in Munich. The atmosphere inside the stadium is absolutely amazing since it can accommodate so many people at the same time. We arrived about 1,5 hours before kick-off and quickly found a good seat. One of Munichs’ favourite radio channels offered a pre-football programm. One girl had the chance to do a 100,000 € shot but unfortunately missed the goal. Furthermore there was a brazilian percussion band which drummed and danced on a stage. I really enjoyed it. Shortly before the match we got beer and pretzels (yes we are in bavaria ;)) and managed to find our seats on time:) ! With every goal of Germany all people completely went crazy and started shouting the name of the scorer. Especially the Portugal match (4:0 ) was so much fun! Tomorrow I will go and see the match against France in a beer garden. I am really excited about the match and hope that the German Team will win. Last week at Allianz ! this week is my last one at Allianz already. I cannot believe that three months have gone by so quickly. I am very sad and have to admit that I am really attached to the job and as well to my colleagues. My feelings about the job are very positive and I would love to do something equivalent in the future. The internship helped me to closer specify my plans for the future and to establish interesting contacts in the field of Sport Sponsoring. Besides I also collected ideas for my master thesis which I will begin in July. During the last months I repeatedly had a look at the other blogs and admired the beautiful sites of the other companies. Nonetheless I have never felt upset about my own placement. The location of Allianz in Munich turned out to be absolutely amazing since every weekend spent here felt like a short break. I went hiking and visited some of the beautiful mountain lakes in the area. As well for playing golf Munich proved to be great. Besides I enjoyed the cultural opportunities in Munich and went to Pinakothek and to philharmonic orchestra. Aside from that I visited the Nymphenburg castle and went to the outdoor theatre. In a nutshell: Munich is so attractive! I am very very grateful about the internship and still cannot believe that I was selected! Next week I will upload more pictures for you to see! 🙂 Now I will try to complete or pass on my projects! first of all I am very sorry for that I let so much time lapse away since my last blog entry. I will try to make up for this now! What did I do in the last weeks? Honestly, I experienced very intense weeks here at Allianz because I was included in so many different projects. I also spent some weekend time at work which finally turned out to be one of the highlights of my internship. 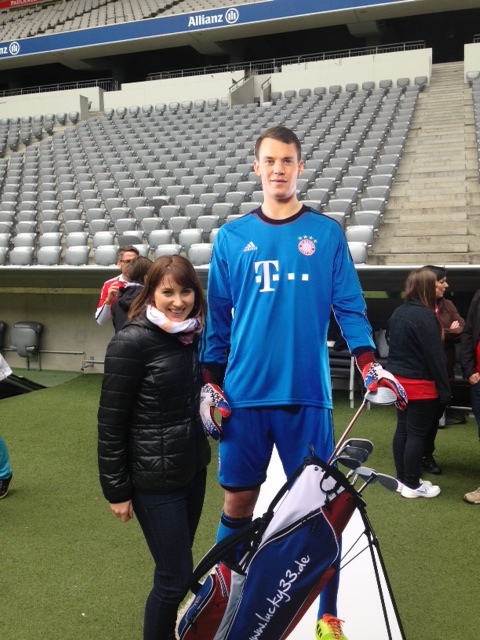 Two weeks ago we implemented the event “golfing at Allianz Arena”. 33 people could win tickets for this weekend event via Facebook by uploading their best golf/ FC Bayern picture. During this event they could tee off the upper circle in the arena and putt inside the team dressing room of FC Bayern München. Furthermore they could chip of the hallowed turf and meet some golf professionals! It was a very exciting day for me especially because I am such a golf fan myself. My job during the event was mentoring a golf quiz together with Stephan Lehmann. We asked the participants questions about Solheim Cup and other interesting golf topics. I really enjoyed this day and was so happy to be on-site. Last week I also met with Viktoriia, the intern at Munich Re. She also won the internship on Blindapplying and is located here in Munich. We spent a very nice and relaxed afternoon together enjoying some sun in the english garden. It was interesting to hear about her job and her plans for the future. Unfortunately there are only 4 weeks left for me here at Allianz… Afterwards I will start my master thesis home in Duisburg and continue my job at the golf club. I am looking forward to that but I am as well very sad to leave Munich and my workplace. Nevertheless I am looking forward to the next weeks and will try to keep you posted! I’ll catch up with you later! I hope that you all had happy Easter days! I spent my short Easter break at home in Duisburg with my family and friends. Since the beginning of my internship coincided with my last exam period I was running low on time in the end. For this reason I was not able to meet my friends before departure which I made good for over the Easter days. I also participated in a golf cup which was not very successful but a great personal experience. On Monday I returned to Munich and was really happy about it. I had not thought before that Munich could become my second home so quickly. I enjoy living in such a big and bustling city and I appreciate the hospitality of people here. Also the fact that every day after work I can experience something new completely thrills me! But what I realise on a daily basis: Time flies! At work I am involved in the organization and preparation of the FC Bayern München- SV Werder Bremen football match on Saturday. Due to the fact that it will be a match of FCB this time I again get the chance to be involved in the arena. I was also lucky and got my hand on a ticket for the Champions League semi-final on Tuesday. One of my friends here from work got a positive answer from the ticket lottery and had a spare ticket for me 🙂 ! It looks like I am becoming a football fan because of this internship. After the match on Tuesday I will write again and try to pass on some of my impressions to you! today it is again Tuesday and this indicates that I have spent one week at Allianz already. On my first day I was picked up at the entry gate at 9 o’clock and had a first closer look at the office and the building. I met many new colleagues and was welcomed in a very friendly way. The other intern who started about 3 months earlier helped me to get started and to set up my new workspace. I received an employee ID card and had my first lunch in the cafeteria which was a positive experience. The rest of my first day I tried to gather as much information as possible about daily business and the single tasks of my new colleagues. At quarter past 5 I went home and was very tired but as well very happy. The second day was even more exciting than the first one. In the morning I was very lucky since one of my colleagues took me to Allianz arena- the huge home soccer arena of FC Bayern München. I could visit the arena and the VIP executive boxes of Allianz and have a seat on coach’s bench. The atmosphere inside the arena was amazing although there weren’t even other people. It is just so big and impressive. Here are some pictures for you to see what I mean. Last Sunday I as well spent my day in the arena since the football match TSV 1860 München- Karlsruhe SC took place. Our team welcomed guests in the VIP area and supervised processes. I really enjoyed it and was glad to be involved. Now I am getting more and more introduced in golf events- which is just great. I also played golf myself on Saturday and afterwards visited some sightseeing monuments together with some other interns! I have to admit- I really enjoy my time in Munich. I will keep you updated about everything! Hello, that’s me! I am the new intern at Allianz Munich! I am very excited to be able to share the experience of my following three months with you! First of all I would like to introduce myself. 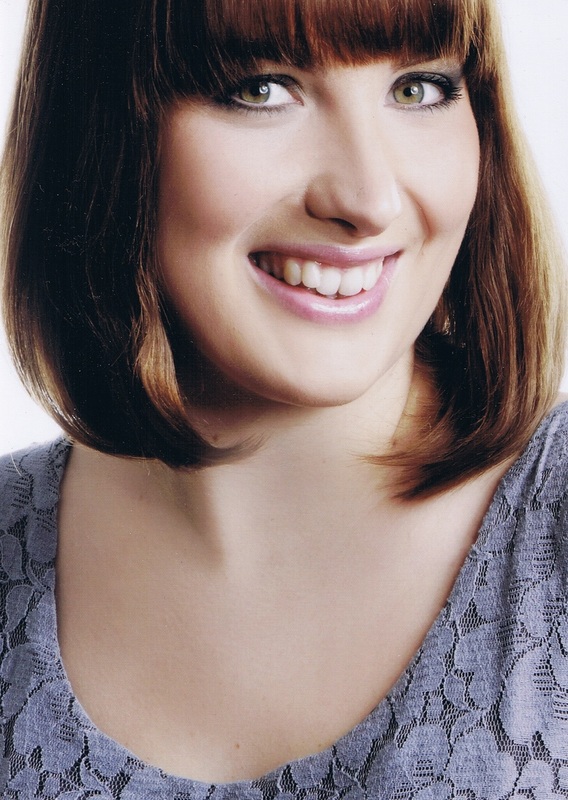 My name is Katrin Pinkwart, I am 25 years old and student of Marketing Management at TU Dortmund University. Next February I will finish my Master’s degree and start my working career. To be able to profit from major working experience I decided to apply on blindapplying.com and take part in Blind Applying campaign. I thought it was a fascinating project since I could apply on 18 internships at the same time. I liked the surprise about it and was curious if something would finally reveal for me. Honestly I did not imagine to be chosen by one of the 18 companies and was really excited when receiving an interview invitation from Allianz Munich. Now it is only a few days before I will start my internship in the field of Sports Sponsoring. I hope to be able to meet many interesting people and improve my skills within the range of organization. Besides I believe it is a huge chance for me to work at a well-respected company like Allianz! It is really interesting to learn about the working system and correlations in such a large business. Since I am very concerned with sports the internship seems to be perfect for me. Especially the fields of golf and soccer draw my interest! So all that’s left to say for today is that I am so curious about the next 3 months and will give you detailed information on my internship! I would be happy to receive comments and feedback from you! katrinpinkwart1989 on Last week at Allianz ! Andreas on Last week at Allianz !